In Philadelphia, you should never be at a loss on where to find the finest craft beer, the nearest Wawa, or a really, really good burger. Being Philly, however, our culinary choices when it comes to this most American of sandwiches aren't limited to the classic beef patty with a layer of tomato and lettuce; lovers of gourmet cheeses, unexpected toppings, and even vegan options can all find a burger to call their own in this city. From hidden gems in surprising neighborhoods to classic standbys worth the wait, these 11 spots serve the best burgers in the city. 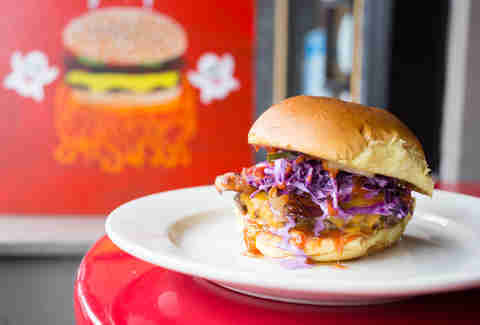 It's still kind of unclear what exactly is in the secret SPOT sauce, but you should probably get it on whatever specialty burger you choose, whether it’s the $8 namesake burger topped with sharp cheddar, smoked coleslaw, and bacon, or the Billy burger with goat cheese and sautéed spinach. You can easily turn the already delicious REX burger into a breakfast option, with an oozing fried egg and bacon over the 8-ounce patty, which already comes equipped with crispy red onions and pimento cheese. REX knows how to prepare the burger perfectly too, so if you like yours medium-rare, expect a burger with exactly the right shade of red inside. 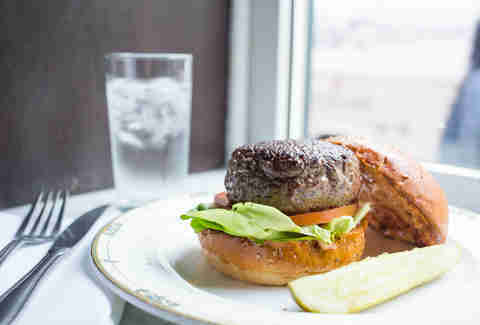 While in the midst of eating the Rouge burger, you might think you can’t complete it, but persevere because there’s basically nowhere else in the city to get such perfectly prepared Gruyère, bibb lettuce, caramelized onions, tomato, and dill pickle-packed challah rolls for dinner. And then, just for a flourish, don’t leave that side of pommes frites behind, either. 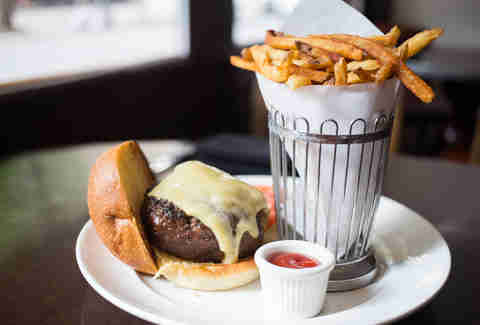 A train ride to the Mainline is worth it for this upscale eatery’s enormous “Silverburger” with a side of truffle fries and an optional spiced fried egg and/or mushrooms. 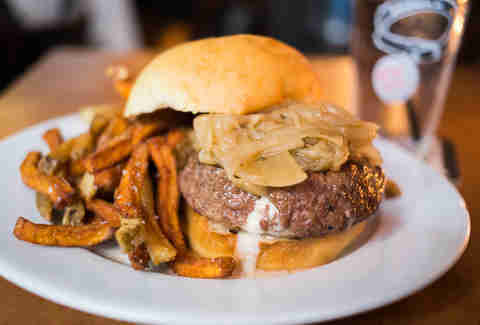 The burger is topped with the restaurant’s specialty in-house onion jam, as well as aioli and Swiss on grass-fed beef. The cozy, dimly lit setting at Good Dog calls for a hearty beer and comfort food, and on the off chance you’re not looking for a pot of mac & cheese (or you want to make your meal very filling), go for the house burger. The sirloin patty is stuffed with Roquefort cheese and topped with caramelized onions, all served on challah bread -- and there's a veggie version on the menu as well, so you really have no reason not to try the place out. 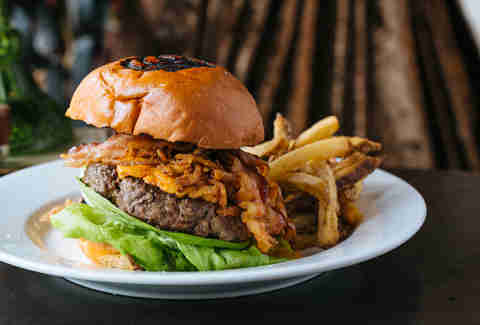 The food menu at Hilltown is a hidden gem in the Roxborough ‘hood, and getting through any of the five burgers on the menu is a feat that's not to be underestimated; try the barbecue burger with house sauce, fried onion straws, and bacon. Consider the uphill walk part of your pre-meal preparation. Best ordered medium-rare with a side of duck fat fries, the Whisky King burger spares no expense, topped as it is with foie gras, applewood bacon, blue cheese, and maple-bourbon glazed cipollini. The veggie burger is also a delicious option for anybody, even meat-lovers, thanks to its combo of guacamole, black beans, and lentils. The Belgian Cafe might be better known for its extensive beer menu, frites, and mussels, but the eight burger options -- plus the essentially build-your-own sandwich portion of the menu -- are not to be overlooked, either. 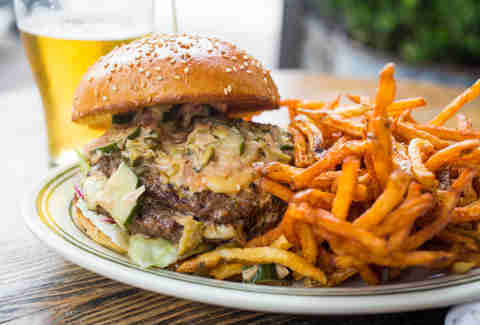 The Delvaux burger (with beer-brined cheese and daikon sprouts) offers a gourmet twist, while the Eddy Merckx burger pairs pickled jalapeños and brie for an unexpected flavor combination. The farm-fresh, seasonal menu at Pub & Kitchen gets updated consistently, but it’s always a good destination for vegetarian and carnivorous friends alike to find something to eat. Case in point: the sweet potato falafel veggie burger, which gets spiced with Ethiopian berbere and finished with red cabbage and a side of the mysterious “special sauce.” Honestly, can you even call it special sauce if it's not mysterious? 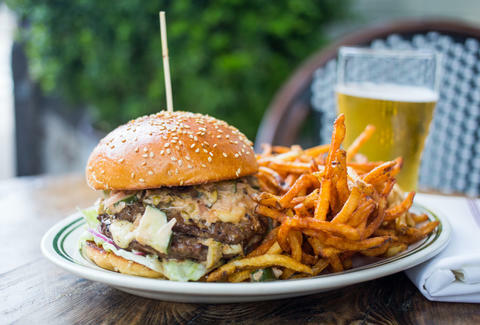 As you might expect, the Standard burger is the quintessential food to pair with the house’s massive rotating beer list and addictive fries. True to its name, the Standard's prepared traditionally with your choice of cheese and other toppings -- because there’s no need to go for extra frills when you’re dealing with a perfectly prepared classic. 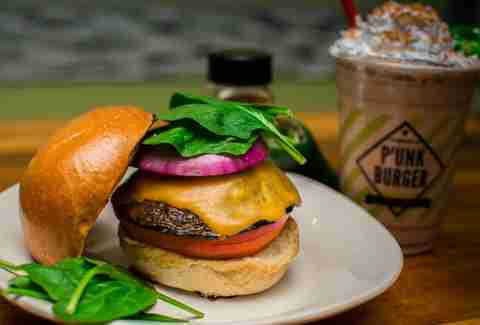 P’unk Burger has hit its stride since opening in fall 2014, attracting regulars with its build-your-own and deluxe burgers alike, as well as house-made shakes that come in flavors like salted avocado, peanut butter jam, and Nutella. (They also come in vegan varieties.) For burgers, though, you can go the custom route (and swap out the meat with chicken, mushroom, lamb, or turkey), or go for one of the ambitiously designed deluxe burgers, like the Big Man on Campus option that features American cheese-stuffed meat covered with garlic and bacon. Marielle Mondon is a writer from Philadelphia. Follow her on Twitter and Instagram @MarielleMondon.